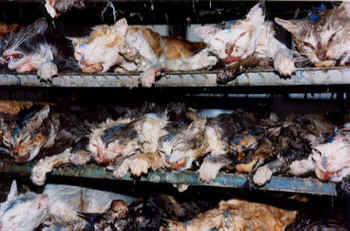 PETA's late 1990's investigation of one facility supplying thousands of cats for many years to high schools and college dissection classes all over the U.S.: "PETA released investigators’ photographs and videotaped footage taken inside Carolina Biological Supply Company, the nation’s largest biological supply house. For many college students who take anatomy and physiology there is the much anticipated cat dissection. But this spring, LaGuardia Community College students taking that course will walk into a very different science lab. Gone will be the cat cadaver, the putrid smell of formaldehyde and the scalpel. Instead, students will be building clay models. LaGuardia is the first CUNY campus, and one of the first community colleges in the nation, where its students will be learning the muscles of the human body not by dissecting cat specimens but by applying clay muscles to a skeletal mannequin. Professor Haspel is confident the clay mannequin is an effective learning tool after a successful pilot program the department conducted over two semesters beginning in 2007. Involved in the experiment were 10 classes where the students were divided into five conventional and five mannequin groups. The professor pointed to test results that indicated that the clay-modeling group was significantly better at identifying human muscles on human models than the cat-dissection group. They were also as good at identifying muscles on their self-made clay mannequins as the cat-dissection group was at identifying cat muscles on its specimens. “A greater number of students in the clay-modeling group received grades of A or B and fewer grades of C, D and F,” she added. This spring, the over 600 students in 23 sections of anatomy and physiology will work on mannequins during five lab sessions. Divided into groups of three and four, the students will stretch clay into thin muscle-like bands between origins and insertions on the 28-inch human skeletal mannequins. The idea of replacing the cat cadavers with the clay mannequins was planted several years ago when a student, who was a practicing Buddhist, objected to dissecting a cat. She researched the web and found Zahourek Systems, a company in Colorado that manufactured mannequins, and purchased the kit and materials. With that, Dr. Haspel approached the company, which agreed to lend all the materials to run the pilot. To purchase the 159 skeletal mannequins and kits, the department received an $110,000 New York State Perkins grant. LaGuardia Community College located in Long Island City, Queens, was founded in 1971 as a bold experiment in opening the doors of higher education to all, and we proudly carry forward that legacy today. LaGuardia educates students through over 50 degree, certificate and continuing education programs, providing an inspiring place for students to achieve their dreams. Upon graduation, LaGuardia students’ lives are transformed as family income increases 17%, and students transfer to four-year colleges at twice the national average. Part of the City University of New York (CUNY), LaGuardia is a nationally recognized leader among community colleges for our boundary-breaking success educating underserved students. At LaGuardia, we imagine new ideas; create new curriculum and pioneer programs to make our community and our country stronger.